It’s happened, in Michigan at least. There’s football on screens, hot cider in hands, the shrill whine of leaf blowers in the air. Summer has left the building. It’s around this time of year that the trutta army starts to splinter. Some drop the rod and pick up the bow or gun and hunt elk, deer, birds. Others start their long-awaited two-handed enterprise of the year. This week’s column goes out to the guys who want to keep trouting, or if you’re like me and have been caught up hucking the big stuff at toothy beasts these last few weeks, to return to the finesse roots of the sport before winter swoops in to limit your options. Last week I had a great conversation on the subject of fall opportunities with my friend Alex Lafkas, a guide at the top of his game and a threat to brown trout from Michigan’s Au Sable to Arkansas’s White River and quite a few places in between. Whether you’re looking for numbers of fish or The One, here’s what lies ahead for the committed trout bum from here on out to the New Year. September heading into October places us just at the tail end of the terrestrial season, with just a bit of good dry fly opportunity left. “Save that effort for the middle part of the day, sunny days being best,” Lafkas advises. There are still plenty of fish willing to look up, but temperatures play a more important role in their willingness to commit to a fly in the film. Optimal dry fly locations change a bit as well. With the low water characteristic of most rivers in early autumn, fishing to bankside structure is no longer par for the course. Instead, turn your attention to the center of the river, that area where you typically get your spring and summer wading done. Those mid-river seams and bubble lines can be the dry fly angler’s meal ticket this time of year. A parting tip to the late-season dry fly angler: carry ants. And make sure a few of them have wings. This is the time of year to be on the lookout for the coveted/hallowed flying ant hatch. Some go their whole lives without seeing one, but those that have know that it’s some of the best surface action you could hope to encounter. Lafkas with a post-spawn streamer-caught pig. According to Lafkas, there’s an easy explanation for the fall streamer bite—the spawn. “Everything in the fall is dictated by the need to spawn, and the need to spawn is just another way of saying the need to eat.” Late September usually kicks of this bite, and the following few weeks typically represent excellent fishing for both numbers of fish as well as size. That said, size of fish is not always proportional to size of fly this time of year. Until the first good fall rains bump up the CFS and stain the water, it’s best to downsize and de-color. Smaller flies, more natural colors and less flash is the way to go. Afficionados of the mega-streamer take note: there’s both challenge and reward in this fall finesse streamer game (your shoulder thanks you in advance). The period extending from the end of the spawn to the beginning of true winter is one of your best shots of the year at an honest-to-goodness big fish. 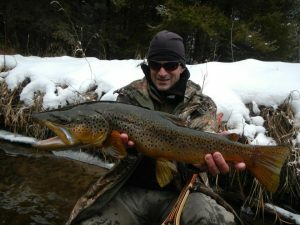 Year in and year out, Lafkas catches some of his best browns in the week between Christmas and New Years. “Fish have bled calories during the spawn, and they really want to get pack on some insurance weight before the real cold weather hits.” These fish got big because they don’t make mistakes. The post-spawn bite is one of those times of year when they get a little careless. Take advantage of this. On rivers with significant summer weed growth, fall represents a time of expanding nymph opportunity—those slower seams and slots are finally free of green and open for business. It’s also time to break out that ‘other’ box of nymphs. 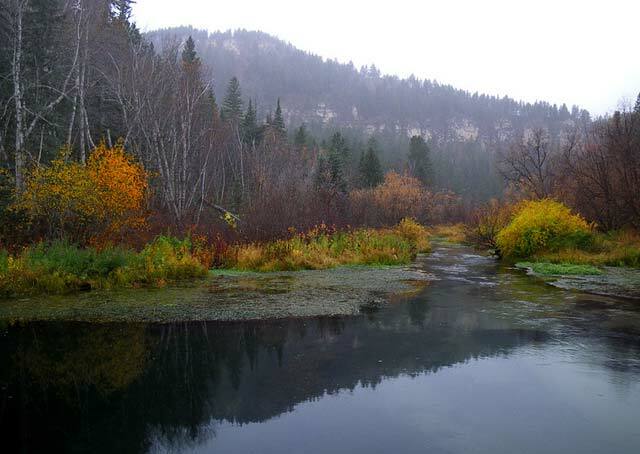 “Stoneflies and midge larvae are my go-to flies in the fall,” Lafkas says. “There isn’t a whole lot of caddis or mayfly activity this time of year, and those bugs that are present are small. But a fish will move, and sometimes move a good distance, for a meaty prince nymph.” If migratory salmonoids are present in your system, egging in the slots behind gravel can also make for some truly epic days. So there’s your siren’s song, in case you needed coaxing. Plenty of fish, including some big boys, no one around, and weather that’s just not too hot or too cold but just right. Sounds like a reason to get some fresh air. Not that you needed the excuse.